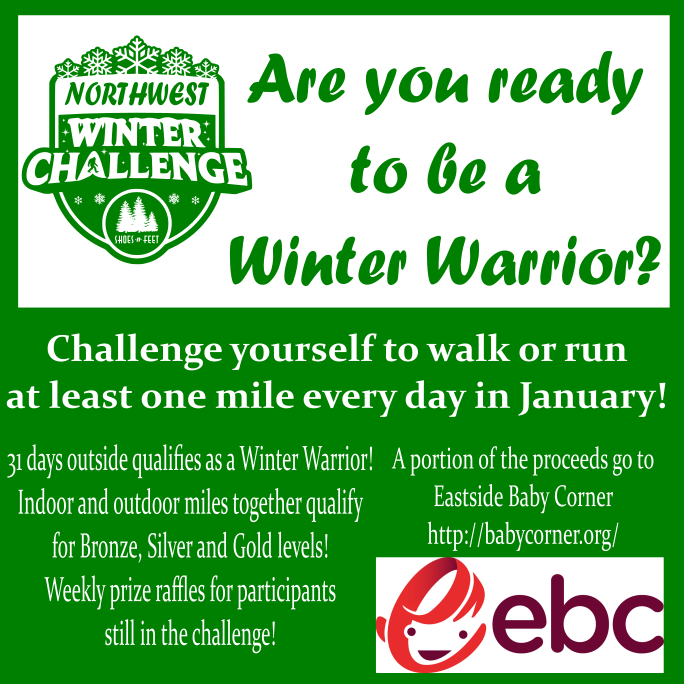 NORTHWEST WINTER CHALLENGE IS ON FOR 2019. We had a blast last January 2018 and we are back for more! 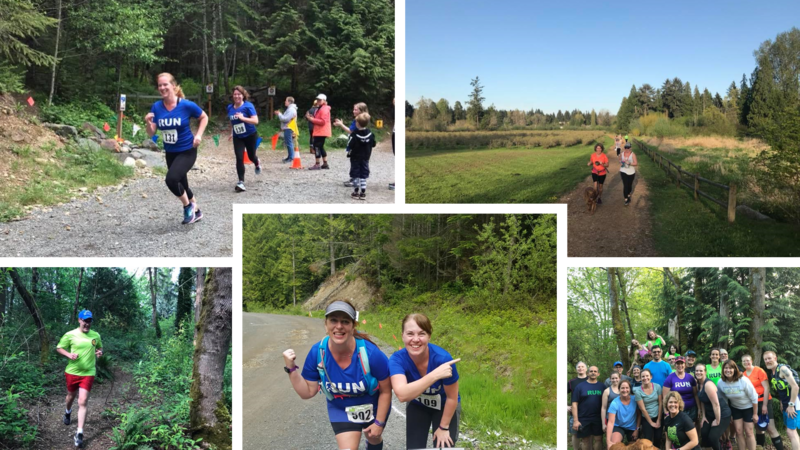 The 2019 Challenge is brought to you by SHOES-n-FEET and Northwest Trail Runs, and raises money for our charity partner, Eastside Baby Corner. You can challenge yourself to any level and can change your mind at any time (you won’t be asked to commit to a level upon registration). But if you miss a day, you’re out! Read the comprehensive rules or continue below for the summary version. If you have registered after 4:45 pm on December 31, 2018, you'll want to read the participant email sent at that time. To complete your challenge, you must run or walk the minimum distance every day, not just averaging that mileage. For example, if you run 5+ miles every day for 30 days and 1 mile on the 31st day, you will finish at the Bronze level. You may do mileage indoors or outdoors and remain in the contest, BUT you are only a Winter Warrior if you do at least one mile a day outside. 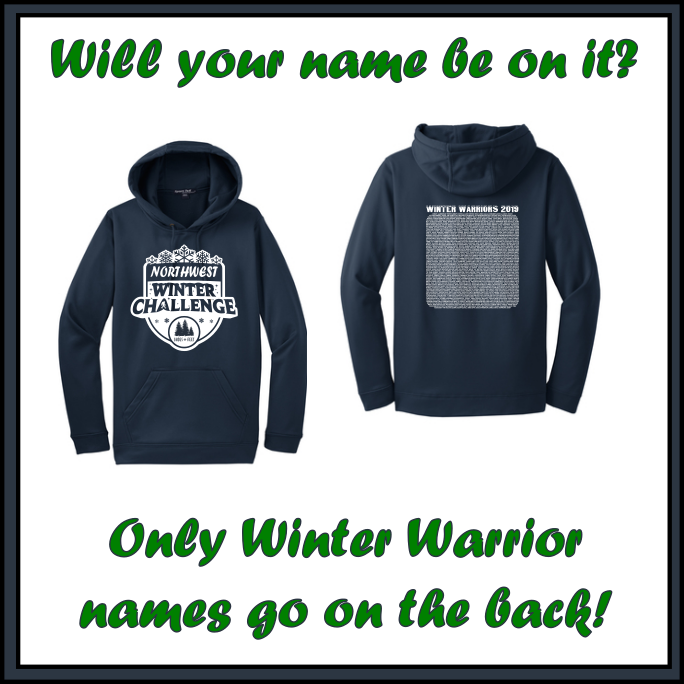 Only Winter Warriors get their name on the back of the shirt and hoodie described below. (racemenu.com/raceday), or on the RaceMenu Raceday iOS mobile app (which you can download from the App Store). Please note that the app will not be live until January 1, 2019. You'll have four days to log each daily run. For example, you have until 11:59 pm on January 5th to log your January 1st run, or until 11:59 pm January 20th to log your January 16th run. If you miss the 4-day deadline, you're out of the challenge--no exceptions. Read this page for instructions on how to log your runs. For the latest updates about the Winter Challenge follow our Facebook event page. That page is a great place to talk smack and connect with other Winter Warriors. Our Instagram handle is @shoes_n_feet_walk_run Please tag us with pics and posts! The Northwest Winter Challenge is much more fun when you create a team and get your friends and family involved. There's strength in numbers because the total mileage for all team members determines your team's ranking on the leaderboard. Check the SHOES-n-FEET website for the winners of daily prize drawings! We have a great pile of prizes to award all month long. Some prizes will be awarded to randomly selected runners, while others will be awarded to runners based on speed, distance, and creative #northwestwinterchallenge posts on social media. 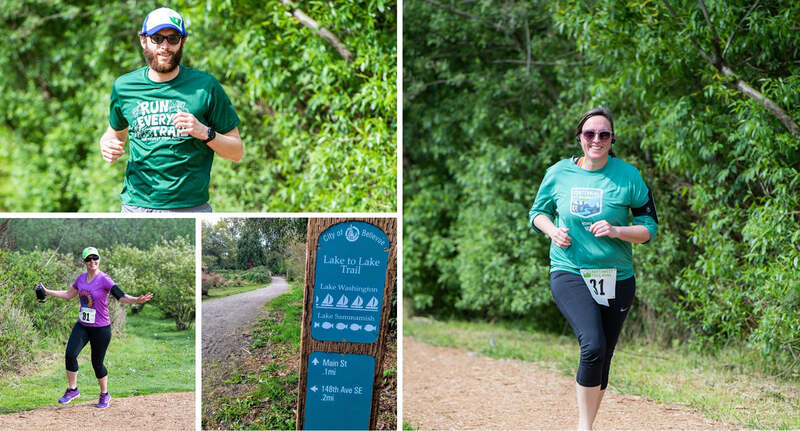 Share your posts with us on the Facebook event page, and Instagram (@shoes_n_feet_walk_run). 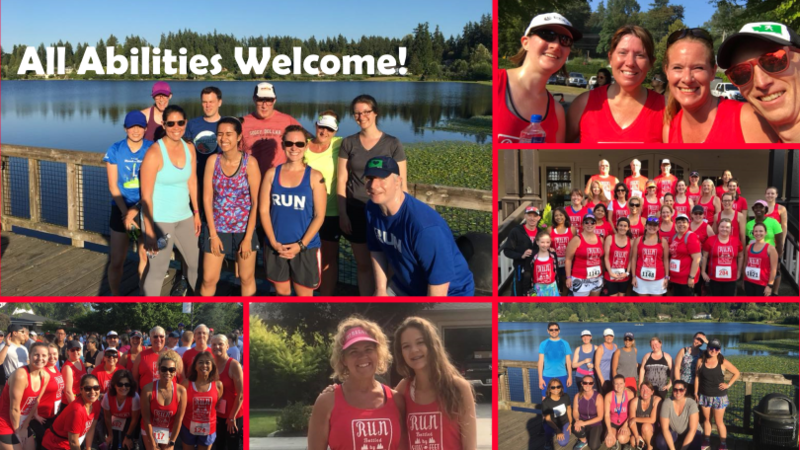 Prizes include free entry to Northwest Trail Runs races, gift cards to shop at SHOES-n-FEET and gift cards towards shoes and gear from top brands like Brooks, Altra, Topo Athletic, Balega, TriggerPoint, Aetrex. Plus we have raffle prizes from sponsoring businesses, including a 6-month membership to Crunch Fitness. Order your shirt, and get your name on it. NEW for 2019 HOODIES AND MEDALS! 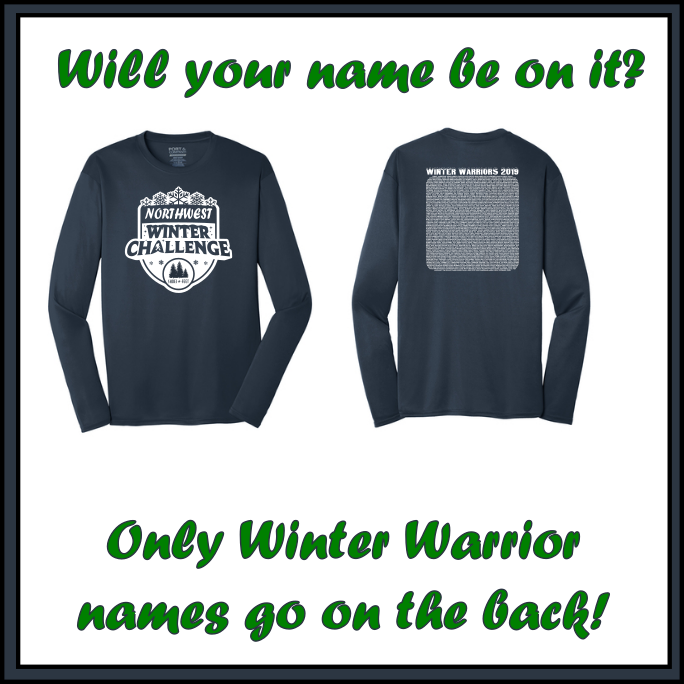 We will have commemorative long sleeve shirts with the name of each Winter Warrior (anyone who gets outdoors for at least 1 mile each day) on the back. You'll purchase the shirt for $15 as part of the registration process. Or this year you can choose a cozy hoodie for $25. In addition, we'll have awesome, large Winter Warrior 2019 medals available for purchase for $10 during registration. Medal images coming soon! If you do not initially order a t-shirt, sweatshirt or medal during registration you will be able to order one after registration. The deadline will be mid-January, 2019 (actual date TBD). To order a shirt, go to the registration page and select: "Shirts, Shipping & Donations Only" and it will take your shirt order. A portion of the proceeds will go to Eastside Baby Corner - New for 2019: Individual fundraising pages! This year, during the registration process you will be given the option to create an individualized fundraising page. This helps you gather more donations for Eastside Baby Corner from friends and family not participating in the contest. EBC helps kids thrive by providing basic necessities for children so that EBC’s partners — schools, human service agencies, food banks, hospitals--can help families become stable, safe, housed, fed and employed. Relying almost exclusively on volunteers, EBC takes in donations of children’s clothing and goods from the community and supplements donations with purchases of the absolute essentials for children we guarantee to provide: baby food, formula, car seats, pack n’ plays and diapers. As the vital safety net under family-assistance providers and families, EBC annually distributes over 70,000 health and care items for kids from birth to age 12 directly to agencies in King, south Snohomish, Kitsap and west Pierce counties. Volunteers contribute an average of 2,700 hours each month at the EBC Central hub, EBC – West Sound hub and EBC – Northshore hub. Founded by a pediatric nurse practitioner, Karen Ridlon in 1990, EBC helps more than 800 children each week. Connect with us: find us on Facebook at https://www.facebook.com/eastsidebabycorner. We are also on Twitter and Instagram, handle @babycorner.